Irish Portrait Painter, Stained Glass Artist: Biography, Paintings. The Irish portraitist and stained glass artist Sarah Purser was born in Dun Laoghaire, Co Dublin, in 1848, one of eleven children. She was related to the famous painter Sir Frederick W Burton RHA (1816-1900). When her father's grain and milling business failed and he emigrated to America, she moved to Dublin with her mother. Already a naturally talented painter, Purser enrolled to learn drawing and fine art painting at the Dublin School of Art (now the National College of Art & Design). In 1872, she exhibited several works at the Royal Hibernian Academy (RHA). After this, aided finanicially by her brothers, she studied in Paris at the Academie Julian. Here she formed friendships with the Swiss artist Louise Breslau, the French Impressionist Berthe Morisot and the White Russian painter Maria Bashkirtseff. In about 1880, Sarah Purser returned to Dublin and set about earning a living from portrait art. Due to her talent as well as her sociability and her friendship with the influential Gore-Booths of County Sligo, she obtained a large number of portrait commissions. As she later admitted: "I went through the British aristocracy like the measles." Her charge for a portrait completed from a photograph, was thirty guineas. Among her sitters were: WB Yeats, Jack B Yeats, Maud Gonne, Roger Casement, James MacNeill, Sir Samuel Ferguson, the Bishops of Belfast, Clogher and Limerick, John Kells Ingram, Sir Henry and Lady Gore-Booth, Douglas Hyde and many others. However, her skills as a painter were not limited to portraiture. Two of her finest and most sympathetic paintings were the genre-paintings: "An Irish Idyll" now hanging in the Ulster Museum, and "Le Petit Déjeuner" now in the National Gallery of Ireland." 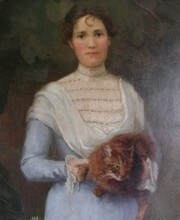 Sarah Purser exhibited widely in Ireland and London. At the Royal Hibernian Academy, the Irish Fine Art Society, in Dublin; at the Royal Academy, Grosvenor Gallery, Fine Art Society and New Gallery, in London; and the Walker Art Gallery in Liverpool. In 1886, she founded the Dublin Art Club, and in 1890 the RHA elected her an honorary member, HRHA. A sparkling if acerbic hostess, she eventually became very wealthy through astute investments, especially in Guinness. She remained extremely active in the Irish art world being involved in the establishment of the Hugh Lane Municipal Gallery of Modern Art, and the acquisition of Charlemont House to house the gallery. She also established a stained glass art business, An Túr Gloine, in 1903. (See also: Stained glass art: materials/methods). She travelled widely in Europe and finally died after a short illness in 1943. Sarah Purser's portraits and other works are represented in all major Irish public collections as well as private collections around the world. The auction record for a work by Sarah Purser was set in 2003, when her portrait painting, entitled Double Portrait of Constance and Eva Gore-Booth as young girls in a woodland setting, was sold at Christie's, in London, for €200,000.  For a personal view of the top painters in Ireland, see: Best Irish Artists.  For details of other portraitists and printmakers, see: Irish Artists: Paintings and Biographies.  For more about portrait artists like Sarah Purser, see: Irish Art Guide.  For more about the art of stained glass, see: Homepage.